Will Archie Sheridan be able to stop his obsession with Gretchen Lowell? Fans of Chelsea Cain’s police detective Archie Sheridan have already been forced to suffer through a lot in the first two books of her gripping Gretchen Lowell series: he almost died twice, became heavily addicted to pain killers and destroyed his marriage because of his obsession with the woman who put him through all this misery. So on the one hand it’s almost a relief to see Archie trying to finally leave his past with Gretchen behind in the third book „Evil at Heart“, even though this means he had to check himself into a mental institution. But on the other hand, seeing Archie in what feels like a prison cell together with an insane roommate and vegging out all day in the asylum is in some ways even worse since it shows how much his nemesis, serial killer Gretchen Lowell, has wrecked him. While Archie spent week over week participating in self-help groups and trying to get Gretchen off his mind, the outside world did the complete opposite and all over America a real „Beauty Killer“ mania broke out with special reports round the clock, Gretchen merchandise on every corner and even fan clubs that are crazy for the attractive serial killer on the loose. I was a bit surprised that after playing such a big role in the second book „Sweetheart“ there were now only a few scenes in which Gretchen Lowell actually made an appearance but nonetheless she was still EVERYWHERE: she was in everyone’s thoughts, on every magazine cover and on every tv channel with such absurd shows like „Americas Sexiest Serial Killers“. So to me it felt a bit as if „Evil at heart“ wasn’t exactly a story about Gretchen Lowell herself but rather about society and its reaction to her crimes. Now you might complain about not getting that many Gretchen scenes as you might have hoped for but I found the state of society that Chelsea Cain described in her novel extremely interesting and also very disturbing because I can totally imagine that such a hype about a serial killer would be possible these days. I often caught myself thinking something like „Where can I get one of those ,Run, Gretchen’ t-shirts“ or „I would definitely join one of those Beauty Killer bus trips and visit the places of her murders“ and found it pretty scary that the sensationalist side of this book and the Gretchen Lowell case had such an appeal to me, too. So if it was Chelsea Cain’s intention to hold a mirror up to society then she definitely succeeded in my opinion and this somehow made me feel very uncomfortable. Talking about the sensationalist aspect of this story let me just say the following: if you’re rather sensitive when it comes to very graphic descriptions of violence then DON’T READ THIS BOOK. 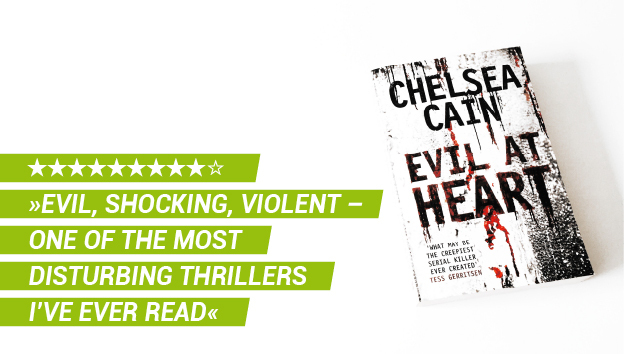 I have read hundreds of thrillers in my life but Chelsea Cain still provides some of the most shocking murders I’ve ever encountered in fiction and some parts really made me worry about the author’s sanity since she let her characters do things to other people that I couldn’t even imagine – and trust me, my evil mind can imagine A LOT ;). I think it’s safe to say that Gretchen Lowell is probably the most terrifying killer I’ve ever met in a thriller or crime novel and that’s not only because she has killed more than 200 people in her criminal career but also because of HOW she killed them. Yes, the story takes a lot of its wicked fascination from the cruel murders but that doesn’t mean that the plot itself isn’t intriguing – which it definitely is. Once again the pace is very high and there’s hardly a single chapter without a WTF moment or an evil cliffhanger and I became so obsessed with the story that I found it impossible to put this book down. In my opinion Gretchen Lowell and Archie Sheridan are among the most fascinating characters in this genre and I couldn’t believe what both of them were capable of – I mean I already knew that Gretchen was insane but even Archie did some things that I found VERY disturbing just to get this case that has ruined his life closed. 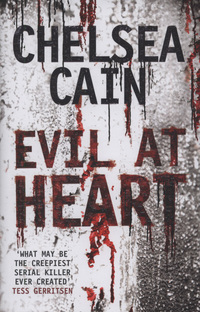 I have to admit that I’m not 100% happy with how Chelsea Cain ended this book because I felt like the showdown lacked a bit of the consequence that I had expected from a series like this but overall „Evil at Heart“ was a hell of a ride and easily became my favorite book in this series so far. If you've already read the first two books in the Gretchen Lowell series and are convinced that nothing will be able to still shock you: Read this wicked piece of a thriller with it's disturbing story and the totally fucked-up characters and let Chelsea Cain teach you better. I think Crini said she’s just not in the next book but then comes back?